On Monday, around 1:27 a.m. EDT (GMT-5), Whitson became America’s most experienced astronaut when her total time in space moved past Jeff Williams’ mark of 534 days two hours and 48 minutes. 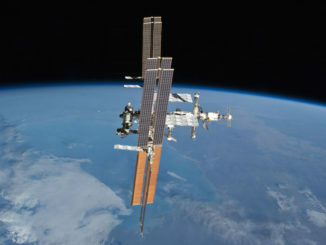 When she returns to Earth Sept. 3, her total time in space will stand at 666 days, moving her up to eighth in the world. Whitson already is the world’s most experienced female spacewalker with 53 hours and 23 minutes of EVA time during eight spacewalks over her three missions. She plans to float outside again on May 12, working with newly arrived crewmate Jack Fischer to carry out a variety of maintenance tasks. Assuming that spacewalk runs the planned six-and-a-half hours, her total for nine EVAs will be nearly 60 hours, moving her up to third in the world overall behind cosmonaut Anatoly Solovyev and former astronaut Mike Lopez-Alegria. 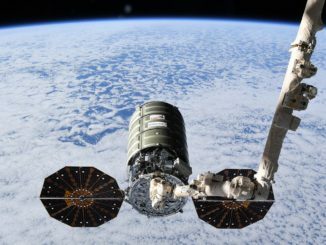 She said the station also is helping engineers test critical life support systems that will be needed for long-duration voyages to Mars. 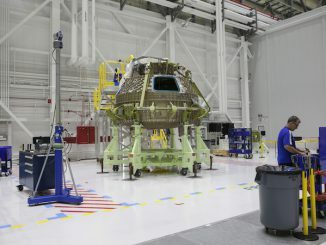 NASA currently is building a huge heavy-lift rocket known as the Space Launch System booster and the Orion capsule to carry astronauts beyond low-Earth orbit. To get to Mars, those systems will have to be tested on deep space missions and a habitat module of some sort will have to be developed. NASA believes it may be possible to send astronauts on fights to at least orbit Mars by the mid 2030s, with landings following at some point after that. President Trump asked Whitson when she thought Americans will be ready for a flight to the red planet. Fischer replied that America’s space program is poised for “an explosion of activity” on the commercial space front. Whitson grew up on a farm in Iowa and went on to earn a doctorate in biochemistry from Rice University in 1985. She worked as a research biochemist for NASA and eventually was selected as an astronaut in 1996. She first flew in space in 2002, flying to the station aboard the shuttle Endeavour and serving for six months as a flight engineer and science officer, returning to Earth aboard Endeavour after logging 184 days 22 hours and 14 minutes in space. She also chalked up her first spacewalk, a four-hour 25-minute excursion using a Russian spacesuit. Whitson took off on her second flight in October 2008, launching from the Baikonur Cosmodrome in Kazakhstan aboard the Soyuz TMA-11 ferry ship. Whitson became the space station’s first female commander and oversaw the attachment of three major modules and a critical robot arm attachment. She also performed five spacewalks during her second mission — pushing her EVA total to 39 hours and 46 minutes — and logged 191 days 17 hours and nine minutes off planet, pushing her cumulative time in space to 376 days 17 hours and 21 minutes. A year and a half later, Whitson took over as chief of NASA’s astronaut office at the Johnson Space Center, the first female, non-military astronaut to head the office. But she never gave up her desire to fly in space again and took off on her current mission on Nov. 17, 2016, joining Soyuz MS-03 commander Oleg Novitskiy and European Space Agency astronaut Thomas Pesquet. She carried out two spacewalks, one in January and and one in March, pushing her total to eight over her three missions. Whitson originally was scheduled to return to Earth June 2 with Novitskiy and Pesquet. But Russia recently opted to reduced its crew complement by one to save money and the most recent Soyuz launched to the station only carried two crew members: Fischer and Soyuz MS-05 commander Fyodor Yurchikhin. They arrived April 20. NASA and Roscosmos, the Russian federal space agency, recently agreed to extend Whitson’s stay by three months to maximize U.S. science. She now plans to return to Earth Sept. 3 with Yurchikhin and Fischer to close out a 289-day flight, pushing her cumulative total to 666 days.